Every company in the logistics sector targets on having an efficient network, which guarantees on time deliveries with a reasonable cost. As the companies expanded and now offer worldwide coverage their networks became extensive and rather complex. The old manual methods of network optimization must now be changed with modern ones, which fully utilize the vast computational capabilities of the modern computers. In the big networks we have to deal we cannot use exhaustive algorithms to find a solution as it would take a massive amount of time to produce results. The effectiveness of a network is becoming more crucial for a company day by day. 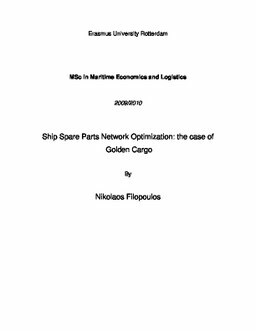 As a test case we used Golden Cargo Logistics, one of the leading companies in ships spare parts supply. The network of the company has been researched in order for its specific attributes to be identified and to give us an insight of how we should deal with them. The network has worldwide coverage and is responsible for the distribution of a considerable amount of spare parts. This thesis tries to provide a solution by using a different than the usual methods, the method of simulated annealing. The history of the method is presented together with some problems it has been used for. The implementation of the method presents different difficulties in every problem. Then we used the method to optimize a network according to the company’s operational schedule. It is a smaller than the original network will be but this fact allowed us to further research different solutions in a limited amount of time. The program that was created produces a complete plan of how the packages of the company should be routed. Finally, the results of the implementation of the method are presented.